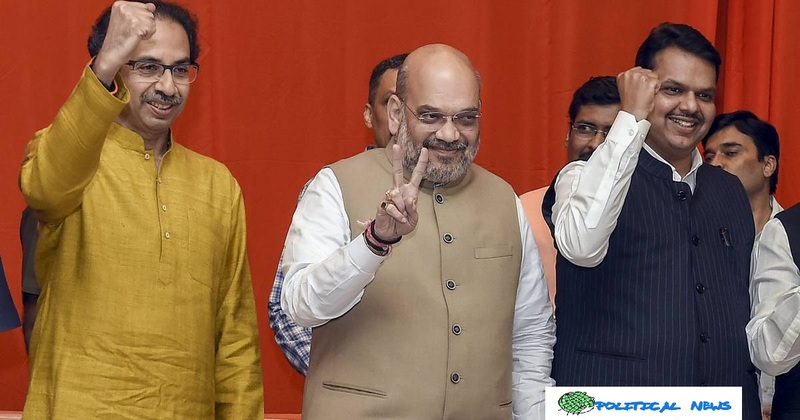 The Bharatiya Janata Party (BJP) and Shiv Sena on Monday reported their pre-survey partnership for the Maharashtra Lok Sabha (LS) and Assembly surveys. As indicated by the seat-sharing arrangement, the BJP will challenge 25 and the Sena 23 of Maharashtra's 48 LS seats. In the Assembly surveys, booked for October, the two gatherings consented to challenge an equivalent number of the state's 288 seats, and suit potential partners similarly inside their separate offers of 144 seats each. The declaration at a question and answer session in Mumbai by Maharashtra Chief Minister Devendra Fadnavis, with BJP President Amit Shah and Sena boss Uddhav Thackeray present, brings the window ornament down on long periods of boast by the Sena that it could leave the union. Maharashtra sends 48 MPs to the LS, second just to Uttar Pradesh's (UP's) 80. In 2014, the BJP and Sena coalition had won 42 of the 48 seats, including a seat won by Swabhimani Paksha pioneer Raju Shetti. Shetti left the National Democratic Alliance (NDA) in 2017. He is presently part of the Congress and Nationalist Congress Party union in Maharashtra. In 2014 LS surveys, the BJP had won 23 and the Sena 18 seats. Nonetheless, the two had gone separate ways for the Assembly surveys held a very long time after the LS surveys, with the BJP rising the single-biggest gathering by winning 122 seats and the Sena winning 63 seats. The relations between the two gatherings have been full of strain over the most recent five years, however the Sena has kept on being a piece of the alliance government in Maharashtra just as at the Center. At the public interview in Mumbai, Shah said the coalition would win 45 of the state's 48 seats. "Our relationship with the Sena goes past governmental issues. We are bound by a longing to see a solid and created India. The choice to challenge together reinforces the NDA altogether. I am certain our coalition will be Maharashtra's solitary decision!" Prime Minister Narendra Modi tweeted. Over the most recent few months, the BJP has hinted at pleasing the requests of its partners, first in Bihar and now Maharashtra. A month ago, the BJP and the Janata Dal (United), or JD(U), declared their coalition in Bihar with the BJP surrendering five of its sitting seats. In 2014, the BJP packed away 22 situates in Bihar. In any case, it will challenge just 17 situates in 2019. Nitish Kumar-drove JD(U) will battle an equivalent number, with Ram Vilas Paswan-drove Lok Janshakti Party challenging six of Bihar's 40 seats. The BJP is getting ready for the projection that it probably won't most likely recurrent its 2014 LS count of winning a straightforward larger part all alone. Aside from Shetti, the BJP has likewise lost the Telugu Desam Party as a partner. In 2014, the BJP had figured out how to win all of almost the majority of the seats in Rajasthan, Gujarat, Madhya Pradesh, Rajasthan, Chhattisgarh, Jharkhand, and UP. Along.